How to add assertions to requests in SoapUI? When you perform a request as a test step in SoapUI, you need to add some assertions to determine if the request is successful or not. You can follow this tutorial to see add assertions to a request in a SoapUI test. 1. Start SoapUI on your computer. 2. Click "File > Import" menu to open your first SoapUI test project stored in "\fyicenter\First-project.xml". 4. Click the "Run" icon on the request window. You see the test step executed. 5. Click the "Assertion" tab at the button of the request window. You see the assertion section opening up with no assertions listed. 6. Click the "+" icon. You see "Add Assertion" window. 7. Click "Property Content > Contains" and "Add". You see the "Contains Assertion" window. 8. 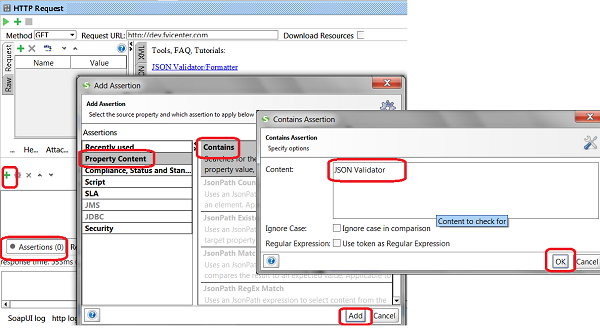 Enter "JSON Validator" in the "Content" field and click "Add". You see an "Contains" assertion added to the request. If you run the request now and the response returned from the server contains the string of "JSON Validator", this assertion will be marked as "VALID". Otherwise, it will be marked as "FAILED".